Built on the ideals of love, respect, and inclusivity, dance music unites its audience, creating a vibe like none other. Ever since the emergence of house music, it has had a far reaching impact on club and pop culture, as well as produces across the world. 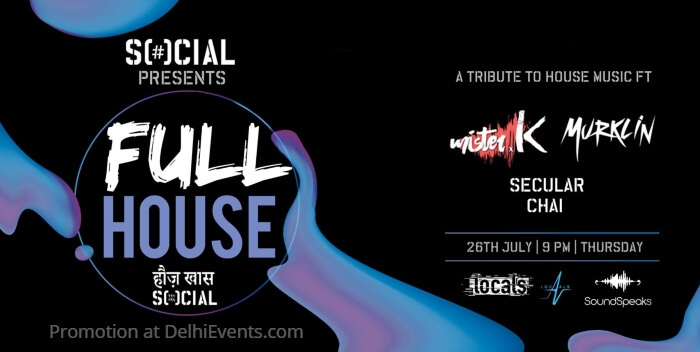 Paying tribute to this genre, Social is thrilled to bring to you, Full House, a night dedicated to house music. Unique to Murklin is his unpredictable style, the ability to mix deep- tech and funk with spacey, groovy tech- house. This has helped him establish himself, and carve a niche in the underground deep techno space. Never a dull moment in his sets, Murklin captivates his audience by constantly keeping them on the edge, wanting more and luring them deeper into the sound. Vijay Kumar, popularly known as mister.K, brings with him an intellectual touch to his music. With deep emphasis on Deep House, Tech House and Techno. His 10 year long relationship with music has given him the chance to travel to the finest venues in the country, allowing him to bring with him his vast experience to each set that he creates. His sole purpose is to constantly surprise people while keeping the vibe extremely melodic and soulful.